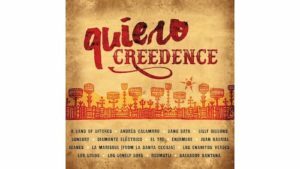 Recently the album Quiero Creedence arrived to the KWCR Music Department, and I literally jumped to check it out. I had heard about it since its release on July 29,2016, and how good it was. 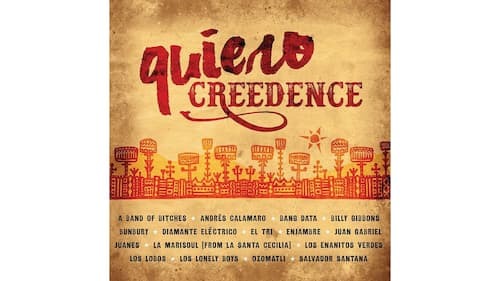 Quiero Creedence is a tribute to Creedence Clear Water Revival, the famous rock band from the 60’s led by John Fogerty. This album is a collaboration of some popular Latin bands and artists such as Juan Gabriel, Los Lobos, Enrique Bunbury, Andres Calamaro, El tri de Mexico, and Los Enanitos Verdes. I was not aware that the album offered more than just rock and roll. For me, because I am a rock fan, it does not bring a lot of my attention. Hold on! I’m not saying the album is bad. In contrast, the album is great for introducing this great music and band to new generations. Yes, the album attempts to introduce this classic band to new Latin generations by implementing juvenile sounds and style. Some of these sounds are punk, reggae, and even hip hop. The album consists of the re-creation of 14 of the most popular CCR hits. As a whole, the album is not that bad, but as many compilations, there are some versions that get better than others. For example, Andres Calamaro’s version of Long As I Can See the Light, and El tri’s version of Proud Mary. These two versions sound about the same as the originals without any improvements. In contrast, the sound of Bang Data in Fortunate Son and Santana in Molina are completely changed far away from rock sound. Maybe the weirdest thing on this album is the version of Have You Even Seen the Rain sung by Juan Gabriel. This version sounds more like a Mexican region song. 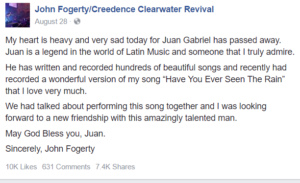 However according to John’s Facebook post, he is happy with Juan’s version. His words are more relevant. 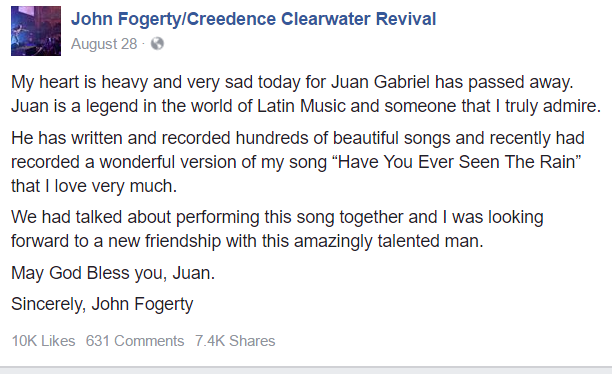 John Fogerty’s Facebook post expressing his feeling for Juan Gabriel’s death. Here is the full album. Give it a try.